When you’re busy at university, you don’t want to spend hours cooking really elaborate meals. Instead, try a few of these – they’re all easy, healthy and (most importantly) really tasty! 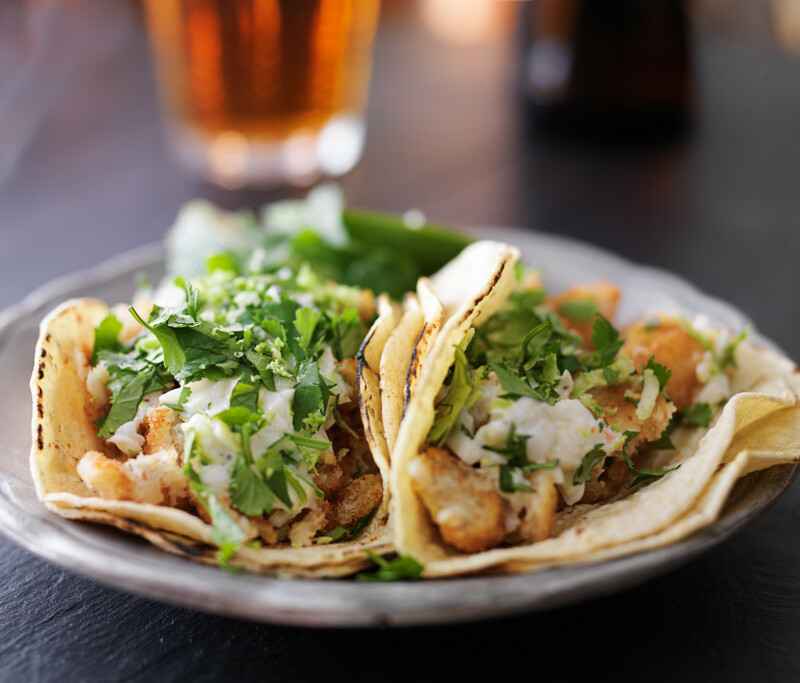 These fish tacos make for a quick and hassle-free meal. All you need to do is chop your ingredients, cook them in a pan, and load up your heated tortillas – easy! If you want to, you can also top your tacos with avocado slices or a little bit of sour cream for added flavour. Choose whole-wheat or cornmeal tortillas if you want to make them healthier. 1. Heat olive oil in a skillet. Sauté onion until translucent, then add garlic. Mix well. 2. Place tilapia on the skillet and cook until the flesh starts to flake. Add jalapeño peppers, tomatoes, cilantro and lime juice. Sauté over medium-high heat for about five minutes, breaking up the fish with the spoon to get everything mixed well; season to taste with salt and pepper. 3. Meanwhile, heat tortillas on a skillet a few minutes on each side to warm (no oil needed). Serve a little over 1/4 cup of fish on each warmed tortillas with a slice or two of avocado and enjoy! 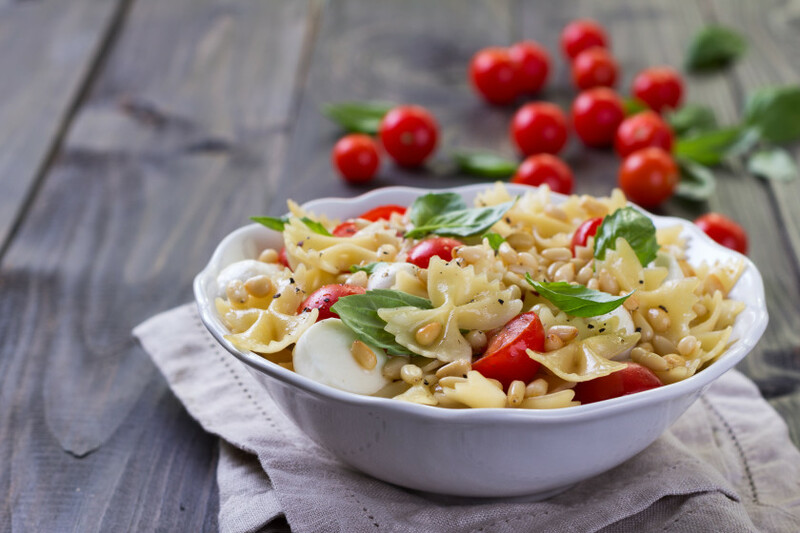 This pasta salad with tomatoes and mozzarella is incredibly easy to make, yet still tastes delicious. While many pasta salads come with a thick, creamy dressing, this one is made with balsamic vinegar and olive oil – a yummy alternative with fewer calories. As for the pasta, you can use any type you like but the whole-wheat kind is high in fibre and more nutritious. 1. Add the tomatoes, garlic, parsley, salt, balsamic vinegar, sugar, red pepper flakes and olive oil to a food processor and pulse until the tomatoes are rough chopped. Let sit for at least one hour, to let the flavours mix. 2. Cook the pasta in a large pot of salted water, according to the package instructions. Drain the pasta. To assemble the salad, add the fresh basil and mozzarella cheese to the bowl with the tomato sauce. Stir to combine. Add the drained pasta and give it a stir to coat, and serve. This easy couscous is perfect for when you come home after a long day at university and don’t feel like spending hours in the kitchen. 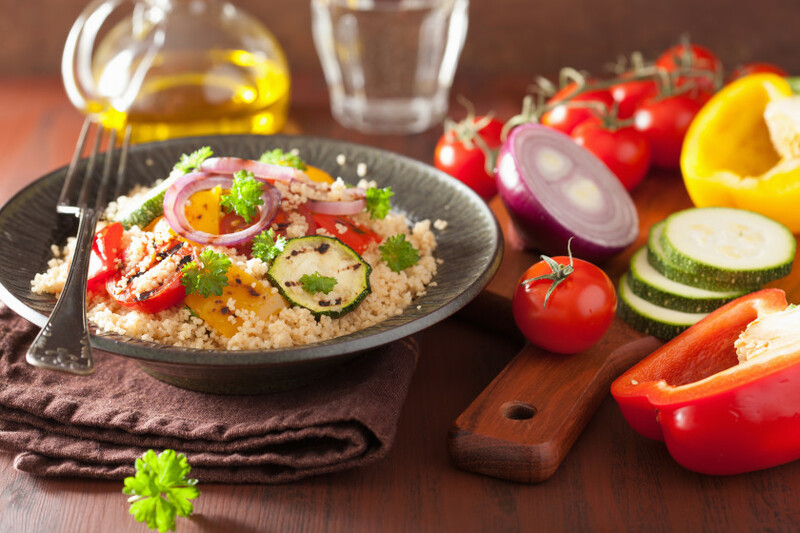 Simply pop your chopped vegetables in the oven, prepare the couscous and mix it all together! The recipe uses quorn cubes, a kind of meat substitute, but if you’re not a fan feel free to leave them out. Alternatively, you could throw in some tofu or, for a non-vegetarian meal, fried chicken breast. 1. Preheat your oven to 200° to 220°C. 2. Deseed and dice the peppers. 3. Dice the courgette and aubergine. 4. Chop up the red onion and the garlic cloves (2 will do, 3 is better). 5. Put all the diced vegetables together in a large roasting tray, drizzle over some olive oil and sprinkle over the thyme, season with pepper and salt and toss it all through. Place it in the preheated oven for 10 minutes. 6. In a pan, heat some olive oil and bake the quorn cubes – you can add some chicken spices if you feel like it, or some paprika powder to spice things up if you like. 7. In another pan, roast the pine nuts. 9. Heat up 400ml chicken broth until it’s boiling hot. 9. Topple the couscous in a large bowl and top it up with the butter, pour over the boiling water and cover the bowl with clingfilm and let it set for 10 minutes. 10. Put all the vegetables in a bowl, top with the quorn and the pine nuts. 11. Fluff up the couscous with a fork and serve together with the vegetables. 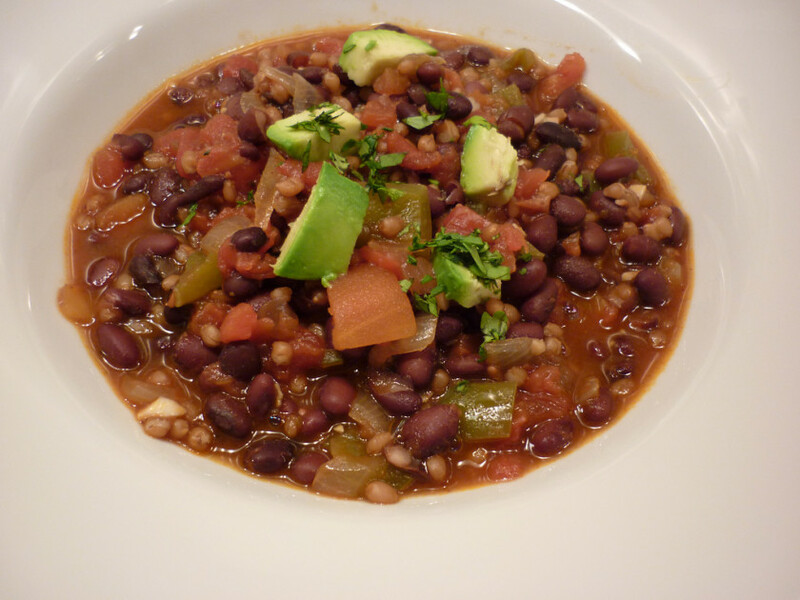 Thanks to lots of different spices, this vegetarian chili is packed with flavour and will definitely warm you up during the colder months. Made with two types of beans, it’s full of fibre, vitamins and iron, and the high protein content will help you stay full for longer. 1. In a large Dutch oven or heavy-bottomed pot over medium heat, warm the olive oil until hot. Add the chopped onion, bell pepper, carrot, celery and ¼ tsp salt. Stir to combine and then cook, stirring occasionally, until the vegetables are tender and the onion is translucent, about seven to 10 minutes. 2. Add the garlic, chilli powder, cumin, smoked paprika (go easy on the paprika if you’re sensitive to spice) and oregano. Cook until fragrant while stirring constantly, about one minute. 3. Add the diced tomatoes and their juices, the drained black beans and pinto beans, vegetable broth (or water) and one bay leaf. Stir to combine, then bring the mixture to a simmer and continue cooking, stirring occasionally and reducing heat as necessary to maintain a gentle simmer, for 30 minutes. Remove the chili from heat. 5. Add the chopped cilantro, stir to blend, and then mix in the vinegar, to taste. Add salt to taste, too – we added ¼ tsp more at this point. Divide the mixture into individual bowls and serve with garnishes of your choice. This stir-fry is great for using up leftover vegetables. The recipe uses carrots, onions, sugar snap peas and peppers, but feel free to throw in whatever you’ve got kicking around in your fridge. The marinade is really simple as well, and doesn’t require a bunch of expensive Asian-style sauces. All you need is a little bit of soy sauce, some orange juice, sugar, garlic and ginger. 1. 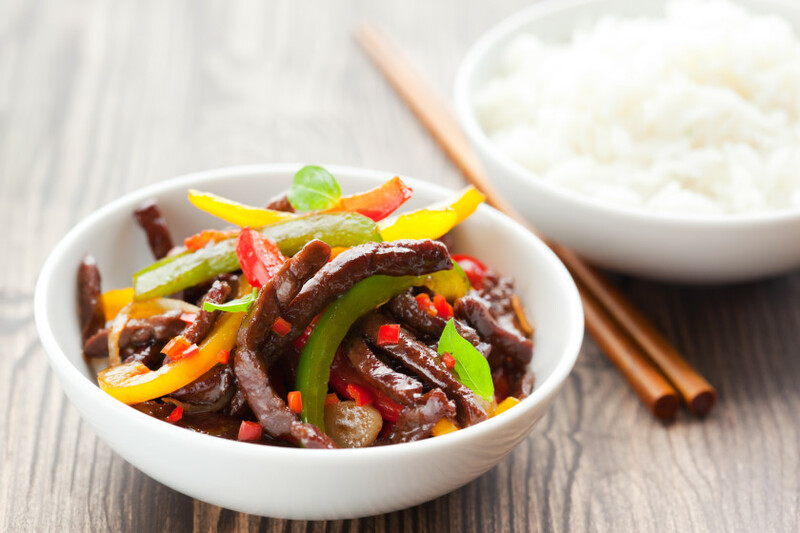 Combine marinade ingredients in a large bowl: orange zest, orange juice, soy sauce, sesame oil, fresh ginger, minced garlic cloves, brown sugar. Mix well. 2. Slice flank steak into very thin strips slicing against the grain. Add sliced steak to your marinade, mix well. Cover and refrigerate for 30 minutes while you prep your veggies. 3. Finely dice your onion, rinse and remove caps from snap peas, slice carrot into matchsticks and slice bell pepper. 4. Preheat a heavy-bottomed skillet or good wok over high heat. 5. Once the skillet is hot, swirl in 1 1/2 tbsp cooking oil. Immediately add onion (1 min stirring constantly). 6. Drain the beef and reserve the marinade. Add drained beef 1/3 at a time and stir constantly for two to three minutes (note: you don’t want to dump in all of the beef at once or you will cool down the pan too quickly; you really want to sear the beef so it doesn’t juice out). Add the extra marinade to the pan. 7. Add vegetables and continue cooking on high heat for two to three minutes, stirring frequently until vegetables soften and sauce starts to thicken. 8. Serve over a bed of hot white rice (or brown rice if you want to be really healthy). Enjoy. 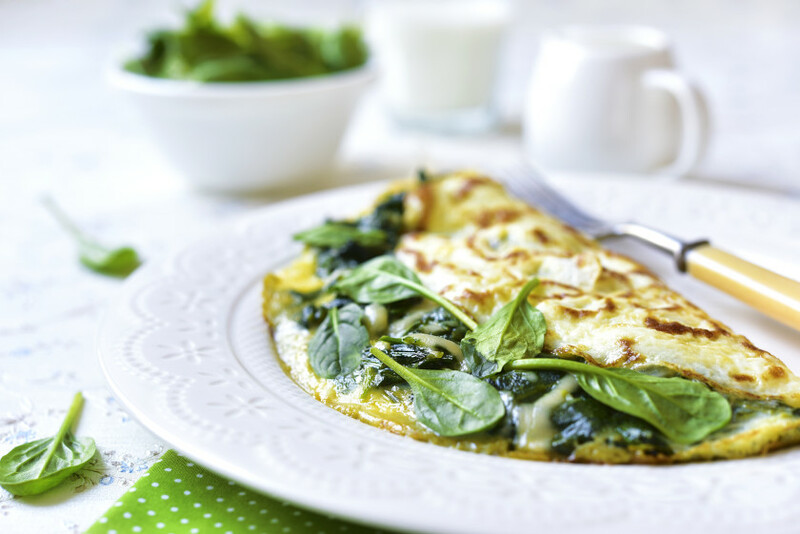 Make this spinach feta omelette for breakfast – it’s really quick and easy. It only takes a few minutes to prepare, the eggs and cheese are packed with protein, and you get a healthy dose of vitamins and iron from the spinach. You can also add chopped tomatoes or whatever else you think goes well with it. Cooking up a perfect omelette can be a little tricky, and you may need a few attempts to get it right. But don’t worry – if you do mess it up you can just turn the dish into scrambled eggs! 1. Heat a non-stick skillet over medium high heat and spray with non-stick spray. Add the spinach, tomatoes and bacon bits with a pinch of salt. 2. Cook until the spinach wilts, about a minute or two. 3. Remove the spinach filling from the pan and set aside. 4. Whisk the two eggs together with a pinch of salt and some black pepper. 5. Lower the heat to medium and re-spray the skillet. 6. Add the whisked eggs to the skillet and swirl around to cover the whole pan. 7. Add the spinach filling to one side of the cooking egg and top with the feta. 8. In about a minute you’ll notice the top of the egg just starting to get firm. At this point run a large plastic flipper under the egg and fold over the best you can. It doesn’t have to perfect. 9. Once it’s folded over cook for about 30 more seconds, flip and cook for another 30 to one minute depending on how well-done you like your egg. This tasty Thai chicken salad only requires a few ingredients, and doesn’t take long to prepare – it’s ideal for a quick lunch or light dinner. 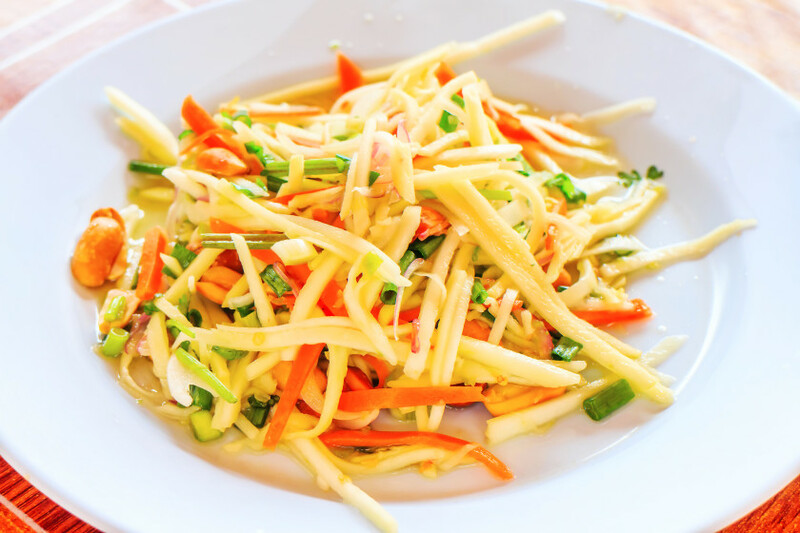 The fruity and refreshing taste from the mango and mint make it a yummy and exotic alternative to a regular salad. And thanks to the chicken and nuts, it’s filling enough that you won’t be back at the fridge half an hour after you’ve eaten! 1. To make the dressing, mix together all the ingredients and stir to dissolve the sugar. 2. In a large bowl, mix all the salad ingredients except the nuts. Toss with the dressing and season with black pepper. Scatter with the nuts to serve. 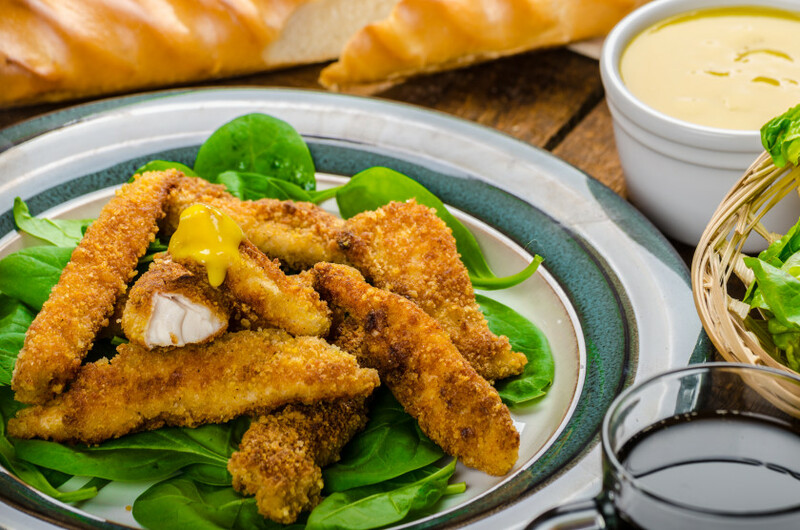 While these coated chicken strips look like fast food, they’re not as bad for you as you might think. Oven-baking is a lot healthier than deep-frying, so you can indulge in them without feeling too guilty. Packed with protein, they make for a great snack or even a full meal when served with a light salad. 1. Preheat oven to 425F/220C. 2. If using scallopini, cut into even-sized strips. Combine salt, pepper, garlic powder, mustard powder and sugar in a bag. Toss with chicken strips to coat. Prepare breading station in three bowls: set up flour in bowl one, lightly beaten eggs in bowl two, and crumbs in bowl three. Dip chicken strips one at a time into flour, shaking off any excess, then into egg, then into the breadcrumbs to coat. 3. Bake on parchment paper-lined baking sheet for 15-18 minutes until coating is lightly golden and chicken is fully cooked (internal temperature should reach 165F/74C). Serve alongside your favourite selection of sauces. 4. For the sauce, pour the mustard, maple syrup and olive oil into a small mixing bowl and whisk together until fully combined. Serve alongside warm chicken strips. This easy to follow recipe takes a little longer to make, but it’s definitely worth the time and effort. Made with asparagus, mint and just a bit of butter and parmesan, it’s a lot healthier than most risottos but still really tasty. The downside is you have to watch over your pot while it simmers. That said, as soon as you taste a forkful of the yummy, creamy dish you probably won’t mind having spent the time on it. 1. Bring the stock to a simmer in a saucepan. Put the olive oil in a separate large pan, add the onion and celery and cook very gently for about 15 minutes, without colouring, until soft. Add the rice (it will sizzle) and turn up the heat. Don’t let the rice or veg catch on the bottom of the pan, so keep it moving. 2. Quickly pour in the vermouth, and keep stirring all the time until it has evaporated. 3. Add the stock to the rice a ladle at a time, stirring and waiting until it has been fully absorbed before adding the next. Turn the heat down to low so the rice doesn’t cook too quickly, otherwise the outside of each grain will be stodgy and the inside hard and nutty (you don’t want to cook it too slowly either, or it will turn into rice pudding!) and continue to add ladlefuls of stock until it has all be absorbed. This should take about 14 to 15 minutes and give you rice that is beginning to soften. Put to one side. 4. 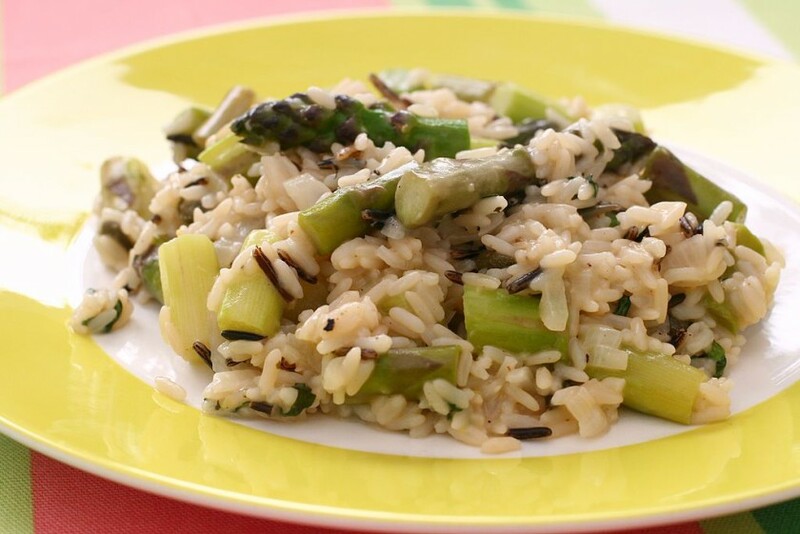 Now put a large saucepan on a medium to high heat and pour in half the stock, followed by all your risotto base and the finely sliced asparagus stalks and the tips. Stirring all the time, gently bring to the boil, then turn the heat down and simmer until almost all the stock has been absorbed. Add the rest of the stock a ladleful at a time until the rice and asparagus are cooked. You might not need all your stock. Be careful not to overcook the rice – check it throughout cooking. It should hold its shape but be soft and creamy, and the overall texture should be slightly looser than you think you want it. 5. Turn off the heat, beat in your butter and parmesan, mint, almost all the lemon zest and all the juice. Check the seasoning and add salt and pepper if needed. Put a lid on the pan and leave the risotto to rest for a minute. Serve with a drizzle of olive oil, a scattering of lemon zest and a block of parmesan on the table. Grilled cheese sandwiches are a staple in American households but they’re not exactly good for you. 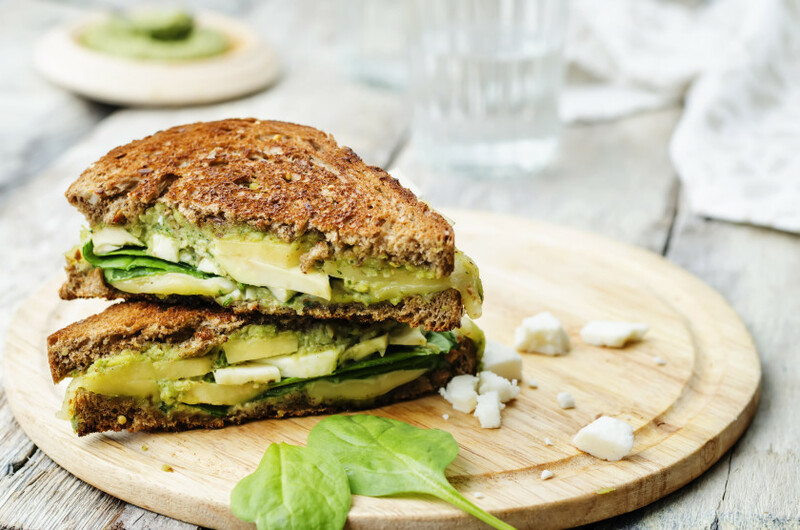 Instead, try out this healthier version with whole-grain bread, artichokes, spinach and two types of cheese. The sandwiches are whipped up in a flash, and perfect for when you crave some comfort food. Plus, whole-grain bread will keep you full for longer and the veggies are a great source of fibre and vitamins. 1. In a large non-stick skillet, melt butter over medium heat. Add garlic and stir until fragrant, approximately 30 seconds. Add spinach and saute until spinach is wilted. Add chopped artichoke and cook until heated through, approximately one to two minutes. Remove from heat and place ingredients into a small bowl. 2. Wipe pan with cloth or paper towel, removing any moisture, and place back onto heat. Liberally spray skillet with cooking spray. While skillet reheats, add Greek yogurt/sour cream to spinach and artichoke mixture. Stir to combine, add salt and pepper to taste. 3. Place two slices of bread in reheated skillet. Sprinkle 1/4 cup mozzarella cheese on each slice followed by 1/4 to 1/2 tbsp parmesan cheese. Spread 1/2 the spinach artichoke mixture onto each slice, spreading evenly. Sprinkle remaining cheeses evenly on top of each sandwich. Place last two bread slices on top of respective sandwiches. Spray the top of the bread slices liberally with cooking spray. 4. Cook sandwiches for approximately two to four minutes, or until bottom slices are nice and golden. Flip sandwich over and heat once again until golden and cheese is melty, this will most likely be faster so keep an eye on them. Serve immediately.